Arrange oven rack to highest level (making sure your cast iron skillet will fit underneath it). Place cast iron skillet on the stove and heat on high for ten minutes. While pan is pre-heating, assemble the pizza. 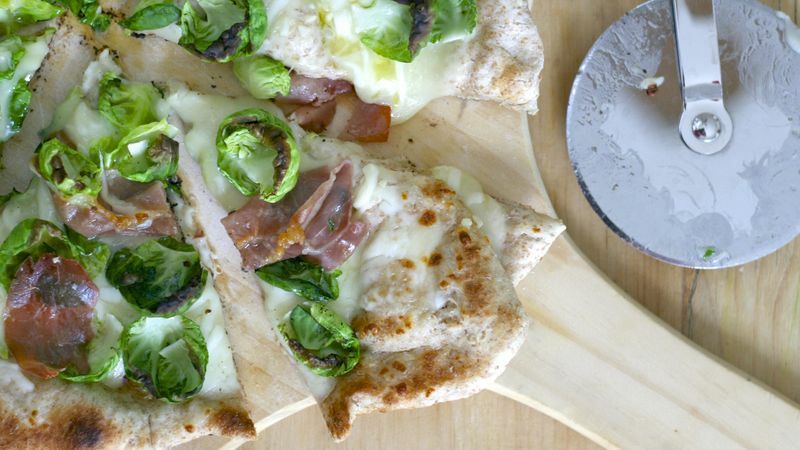 On a well floured pizza peel or wood cutting board, unroll pizza dough and shape into the same size as your skillet. (Trim or stretch dough if needed). In a separate pan, heat olive oil and saute garlic for 60 seconds, or until fragrant. Spread olive oil/garlic mixture onto prepared dough. Sprinkle with shredded cheese, and top with brussels sprout leaves and prosciutto. Sprinkle with Parmesan and red pepper flakes if using. Remove from oven, transfer to a cutting board, and allow to cool for a minute or two. Slice and serve immediately.